Home Blogs administrator's blog "How to Make Your Muscle Car Handle" The Book! 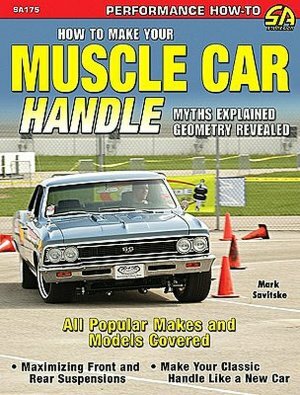 "How to Make Your Muscle Car Handle" The Book! Click "+READ MORE" for text and links. How to Make Your Muscle Car Handle by Mark Savitske There’s little question that one of the most popular upgrades in the muscle car market involves suspension. The vast improvements in modern vehicle handling have prompted a new look at the vintage muscle cars from the past. These great cars, while powerful, did not corner at speed with any genuine confidence. A wide range of improvements are now readily available for all the popular classics, and whether it’s a simple bolt-on or complete suspension redesign, the ability to improve the road-holding ability of your muscle car has never been easier. How to Make Your Muscle Car Handle walks you through these upgrades. So, what is right for you, and your particular car? Some factory designs had flawed geometry, and this can be corrected in many cases using varying techniques, all of which are detailed between the covers. Many original suspension bushings have far outlived their design intent, and upgrade components made using modern materials will offer less flex and more durability than the parts they replace. All of the essential information is here, and it’s backed up with accurate geometry and artwork to convey the message clearly. There is a lot of room for improvement in all the classic designs, whether they are front suspensions relying on coil springs or torsion bars, or rear suspensions built upon either leaf springs or wound coils. How to Make Your Muscle Car Handle defines, explores, and reviews the complete suspension system, and teaches you how to best choose your upgrades for maximum effectiveness. Cornering and handling is becoming a critical part of any performance car, and the great American muscle machines have the potential to do so on par with many modern sports cars. Author Mark Savitske (owner of SC&C) has made a career out of improving the suspension design and performance of these great cars, and all of his experience is evident on the pages of this great new book. NEW REVISED EDITION AVAILABLE NOW!